If you are planning your holiday in Cornwall, then why not consider staying in the beautiful area of Padstow, a picturesque fishing harbour town. With its magical charm and plenty of local attractions, this Cornish town is the focal point of this unspoilt coastal area. Wondering what time of year to holiday in Cornwall? Well why not kick off summer in style, just as Padstow does every year. The beautiful holiday town celebrates the arrival of summer on May Day with the “obby oss” processions through the streets, around the harbour to the maypole. 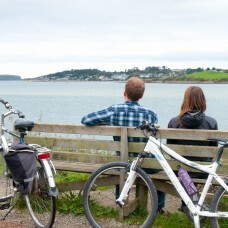 For walkers and cyclists there is the camel trail and coastal path, while golfers have two championship courses to choose from, one of which is within a mile of the Yellow Sands holiday apartments. And if all that isn’t enough to keep you occupied during your holiday in Cornwall, how about pony trekking, theme parks, national trust houses and gardens, including The Eden Project, tennis, swimming pools, go–carts and even parachute jumps? Yes, all that is available here too. Of course, just because you’re staying close to Padstow doesn’t mean you can’t see what else Cornwall has to offer – all the top spots of the region are within an hour’s drive, making Yellow Sands apartments in Cornwall the perfect base for day trips and sightseeing. Local village shops and an array of restaurants and amenities are within a mile at St Merryn Village.